:Guys, what's in your toolboxes? Most of us have hammers and screwdrivers for repairs along with tools for demo work. And power tools-because nothing brings greater happiness than making messes and generating lots of noise. But did you know that God's fingerprints can be found in our toolboxes as well? We can uncover some amazing spiritual lessons tucked between our pliers and wrenches. Sometimes we act as if God's a million miles away when just the opposite is true. God glimpses are present in every aspect of our lives, we just have to look for them. Take a trip through the items in the toolbox with us and discover encouragement, inspiration, and a reminder that God is so close we can reach out and touch Him. We don't know about you, but we want to be powered up and ready for God to use our lives. We want Him to build us into men of character. 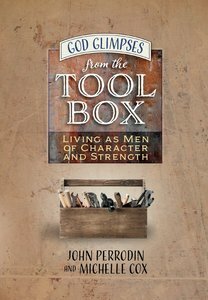 Join us as we look for God glimpses from the toolbox, won't you? About "God Glimpses From the Toolbox"
Known for her encouragement with a Southern drawl, MICHELLE COX is a speaker and an award-winning, best-selling author. She is a member of the blog team for Guideposts, and her Life with a Southern Grandmother column runs twice each week at Guideposts.org. She has written for Focus on the Family, FoxNews.com, Christian Cinema, WHOA Magazine for Women, Leading Hearts Magazine, and the website of Fox News radio host Todd Starnes. Michelle is the creator of the Just 18 Summers brand of parenting products and resources, and has been a guest on numerous television and radio programs, including Hannity and Focus on the Family. She and her husband, Paul, have been married for forty-three years, and have three sons and six perfect grandchildren. John Perrodin is a novelist, researcher, speaker and attorney. He serves as Senior Editor for te Jerry. B. Jenkins Christian Writers Guild. John and his wife Sue have been married for 22 years and have seven children.